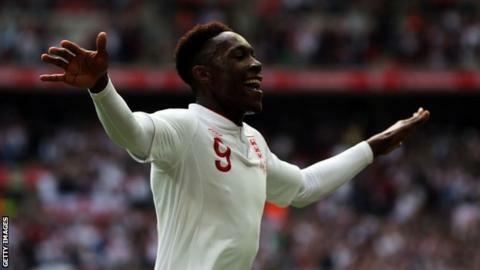 Manchester United striker Danny Welbeck stated his case for inclusion in England's opening game against France in Donetsk with a cleverly taken first-half goal after fine work from Ashley Young. As in the 1-0 win against Norway in Oslo, this was an England performance built on the foundations of solid defence and tactical discipline. Hodgson's approach may not illuminate proceedings in Poland and Ukraine but early evidence suggests they will be tough to break down. If there is a concern, it was the amount of possession England were prepared to concede to Belgium. The visitors were unable to take advantage but Hodgson will know his side must beware against superior opposition carrying a greater threat in front of goal. with defender Gary Cahill substituted early on after a nasty, needless push by Dries Mertens that caused him to collide with goalkeeper Joe Hart, an incident that left the Chelsea defender requiring a precautionary X-ray at Wembley. And Chelsea team-mate John Terry was also left needing a scan after going off with a hamstring injury. Welbeck, in particular, will be happy with his work. Hodgson must now consider whether to promote him above Liverpool's Andy Carroll as Young's strike partner against France. Belgium did provide an anxious moment late on when Guillaume Gillet hit the post, but substitute Jermain Defoe also had a similar near miss for England. Hodgson, however, will be satisfied with another opportunity to see more of his squad play before the serious action starts, their number including Wayne Rooney, who came on as a second-half substitute even though he will miss the first two games of Euro 2012 through suspension. As Hodgson continues to formulate his plans, he handed a first England start to Arsenal teenager Alex Oxlade-Chamberlain and the youngster showed no sign of nerves as he was prominent early on. The Arsenal starlet slipped at the crucial moment as he shaped to meet James Milner's cross, then shot wide from the edge of the area - but his positive approach was clear to see. He was replaced by Theo Walcott after 67 minutes as he faded, but Hodgson will have been pleased by his positive approach on his Wembley debut for England. This was a friendly with a cutting edge and tackles flew in, the worst example being the incident that left Cahill shaken and replaced by Joleon Lescott. Belgium had seen more of the ball than England but it was Hodgson's side that made the breakthrough after 36 minutes with a goal that was a delight in its creation and conclusion. Young's measured pass found his Manchester United team-mate Welbeck, who waited for keeper Simon Mignolet to make his move before scoring with a deft, lofted finish. Hodgson was clearly keen to give Rooney some game time so he was introduced as a substitute for Welbeck after 53 minutes, his first action since Manchester United's final game of the Premier League season at Sunderland on 13 May. The gifted Hazard, like his team, enjoyed plenty of possession without applying an end product. He did test Hart with a curling effort on the hour and seconds later Everton's Marouane Fellaini wasted a better chance by shooting tamely at Hart from only eight yards. Belgium almost found the finishing touch that had eluded them when Gillet hit the outside of the post from 20 yards with Hart well beaten. England's response came swiftly when substitute Defoe struck the woodwork with a low shot in a rare venture into Belgian territory - and as Hodgson's side took a lap of honour after the final whistle there was a mood of cautious optimism in the camp.